Fast Flip is quite neat–pretty addictive, actually. But it’s also…kind of odd. 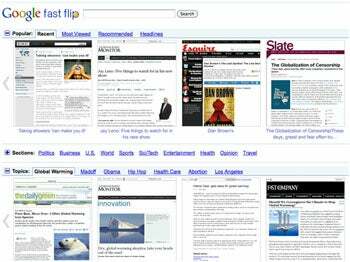 Fast Flip is based on Google News, and Google says it came up with it to address the fact that browsing through news sites is usually a slow process-not at all like the effortless instant gratification of flipping through a magazine or newspaper. 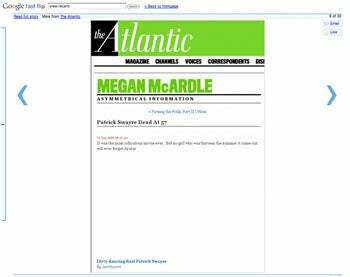 Google has partnered with several dozen news sources-including the BBC, BusinessWeek, the Christian Science Monitor, the Daily Beast, Esquire, the New York Times, Newsweek, Salon, Slate, and TechCrunch-to create previews of their stories that live on Fast Flip but which display the first several paragraphs of the article in a form that looks like the originating site. You rifle through these previews by clicking left and right arrows, and the pages zip on and off-screen in high-speed, fluid animation-hence the “Fast Flip” name. Fast Flip has a Like button that lets you express your approval of stories you like, and Google says that the more you use the service, the smarter it will get about presenting you with stuff you’re likely to be interested in. (It lets you browse in multiple ways-by subject, by provider, and by author.) Oh, and there are mobile versions for iPhone and Android. It doesn’t necessarily make browsing for news faster. The flipping interface shows one story at a time in legible form-versus the dozens that plain ol’ Google News puts on one screen-along with thumbnails in which the headlines are tiny and the articles themselves are too tiny to read. Once you click on a preview, you go to the originating site-which is no faster than usual-and getting back to Fast Flip may be kinda cumbersome, especially if you’ve clicked through to a multi-page article. 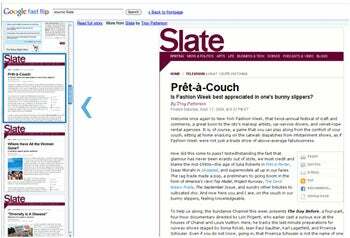 The previews break some conventions of the Web. They may have what seem to be hyperlinks, and tools like icons for printing the page, but none of this stuff works-the preview is a giant hyperlink to the article on the originating site. The ads are un-Google-esque. Google is putting ads in Fast Flip and sharing the revenues with its content partners. Unlike classic Google text ads, these are display ads-tall, skinny ones-and while they’re context sensitive, some of the ones I’m seeing so far are a tad on the cheesy side. I don’t mean to be overly nitpicky-Fast Flip is clever, and I hope it sticks around and evolves. If you check it out, let us know what you think. haven’t tried this but will surely take a look soon.. looks nice.. article from PC World.